Giving Advice: I have been directly asked by a patient, “What should I do?” My typical response is, “It’s not my place to tell you what to do, but together we can work to identify and explore your options.” A patient may choose to come to therapy facing a difficult decision. My role is to teach skills and provide feedback aimed at guiding the patient in determining the best course of action. Unless there is an imminent risk of danger to self or others, I will seldom, if ever, tell a patient what to do. A Confessional: There are many reasons to come for therapy, and frequently people are compelled to seek help because they feel guilt or shame over some past action taken by or against them. That said, I still encounter patients who think therapy is only about revealing secrets, admitting faults, confessing to transgressions, or detailing the worst things that ever happened to them. I explain that they are under no obligation to reveal their darkest secrets, and they are free to share with me as much or as little as they want (though in certain cases, I do encourage more sharing so I may better understand and address their needs). I ask only one thing from new patients: to show up. Anything else I could possibly ask from them, they will want for themselves once they have committed to the process. A Friendship: Because of the highly personal nature of therapy, a patient may form an attachment to the therapist. They may even share similar values, interests, or racial or cultural backgrounds. A therapeutic alliance, however, is a not a friendship (the National Association of Social Workers Code of Ethics forbids dual relationships between therapists and patients). Unlike a friendship, therapy is focused solely on the patient’s needs and concerns. A patient does not need to be concerned about my well-being, only on addressing what brought them to therapy. Also unlike a friend, the patient and I have no prior history, so I view the patient objectively and with unconditional acceptance. I will not take anything said by a patient personally. Going to a Head Shrinker: Therapists are sometimes seen as being overly analytical and emotionally distant, or that we are unwilling to reveal anything about ourselves to patients (the opposite of a friendship). 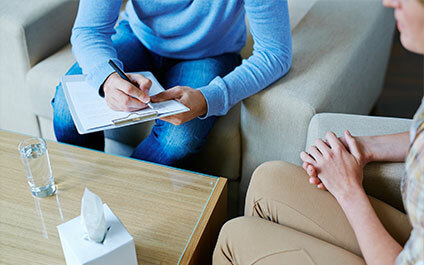 Each therapist has their own unique approach and therapeutic style. Many choose to keep all focus on their patients, while some of us are willing to share some of our personal experiences, but only when it is clinically relevant and of potential therapeutic benefit. Regardless of a therapist’s willingness to self-disclose, it should not be indicative of a lack of caring. I care immensely about my patients, and attempt to convey that through my interest, attention, and empathy. Only for People: I still hear that therapy is only for wealthy people, white people, crazy people, dysfunctional people, neurotic people, depressed and anxious people, or people with traumatic pasts. This simply is not accurate. Patients of all types with a broad range of needs seek out mental health professionals for the same reasons they hire lawyers or call plumbers: because they are seeking help beyond their abilities. Help is available, regardless of a patient’s means. Symmetry Counseling makes all appropriate referrals when the services sought are beyond our scope of practice. With all of this in mind, if you or someone you know are in need of help from experienced and expertly trained professionals, I encourage you to contact Symmetry Counseling through this website or by calling our office to make an appointment with the therapist of your preference.